Is It Good? Detective Comics #47 Review – AiPT! It’s part 3 of Robin War and the Robins aren’t looking to be winning any war in this issue. Be sure to read Grayson #15 before reading this or that issue will be ruined for ya! That said, if you want some Batman vs. Robin action you’re in for a treat here, but is it good? 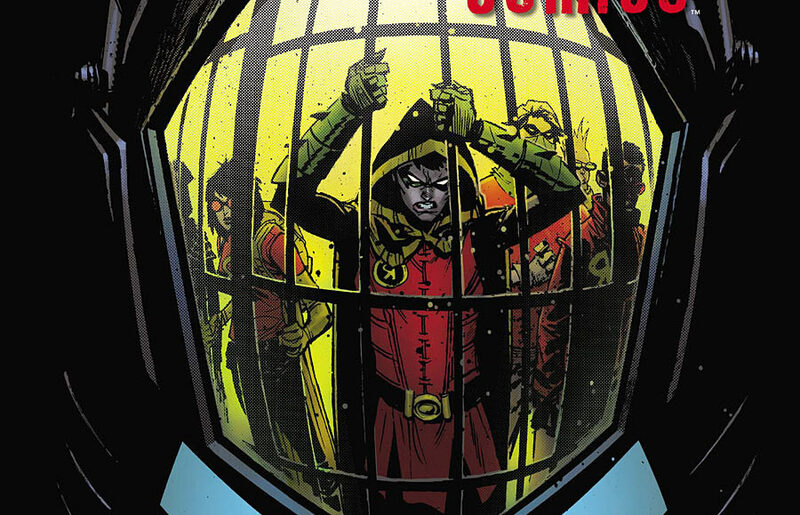 This issue opens where Grayson #15 left off and there’s a lot of bird themed heroes locked up in cages. The fact that these cages hang from the ceiling and are very birdcage looking cannot be by coincidence. Anyway, Batman is none too pleased they’re locked up in cages since many of them are minors. The third part of a five part event means some of the biggest turns occur here. The climax isn’t close just yet, but soon more will be revealed and the conclusion is on the horizon. That means you need to read this issue! Batman vs. Grayson. Nuff said? It’s a battle that’s very well drawn and laid out. Steve Pugh draws a solid action sequence that’s easy to follow and fun. Pugh draws in four or five panels that have all that you need to understand who flips where, who kicks what and where people land, making all the action very fluid and natural. The two page spread revealing our caged Robins is also a very nice touch and it reminded me of Bryan Hitch’s work. It’s very detailed and explores the space in a very pleasing 3-D way. Pugh also draws a very strong short sequence with Damien as he attempts to get out of his cage. It’s a short moment, yet we get very close to Damien extracting a hidden weapon. It’s a tense moment since he can be found out, but also because we’re trying to understand what he’s up to as well. Ray Fawkes writes some fun scenes with Gordon and Bullock that should tickle the fancy of fans. I can’t say I understand why Bullock needs to be smoking near explosive materials so much, but maybe it’s a gag? Fawkes does a nice job plotting the action and tense moments throughout this issue. I’m not sold on how Batman’s story transpires. It makes sense for the overall plot, but why must superhero comics pit heroes against heroes only for them to figure out they need to work together? It’s a bit lazy at this point and the turn of events is so sudden and unearned in this issue it’s a shame. As far as action comics go this is a solid issue. The fact that somebody had the idea to stick the Robins in giant bird cages is hilarious, but overall this is an average issue that doesn’t quite nail the storytelling.